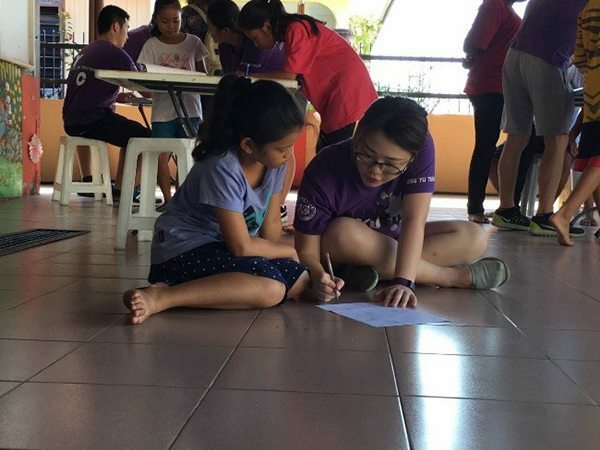 Cheng Yu Tung College (CYTC) held the successful service learning program about voluntary teaching for the needy children (from 5 – 15 years old) in the Livio Learning Center (LLC) in Melaka from June 3rd to 5th. 10 CYTC students from different major and background were interviewed and selected to form a service-learning group to teach 16 children in the LLC. The LLC was established in 1993 as an alternative to a formal education system. Its students comprise children of kindergarten and primary school age who are from broken homes or who have learning difficulties. 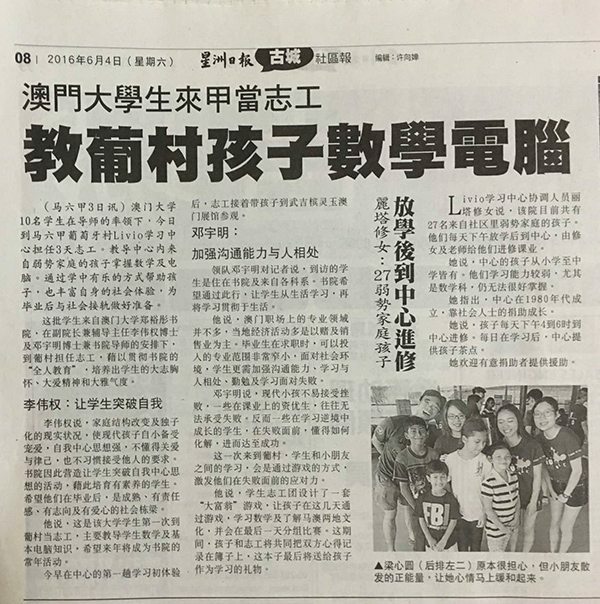 To introduce Macau culture to the children from Melaka and make our students exploring the culture of Melaka at the same time. To accomplish these goals, our students spent almost 3 months in preparation. First, they hold a charity bazaar at the open day of University of Macau at 19/3/2016. 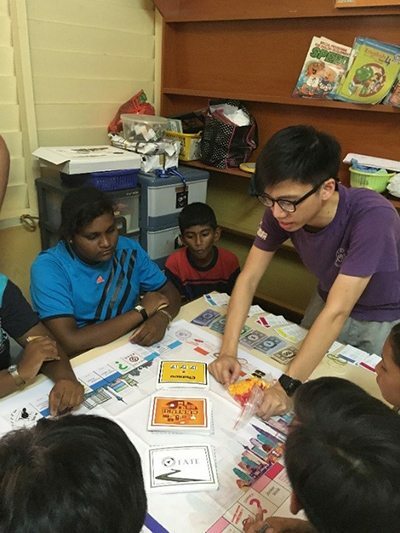 The fund raised in the bazaar was used to produce a board game “CYTC Monopoly” which was designed by the service-learning group. Mathematics syllabus and cultural elements from Macau and Melaka and their corresponding linkage were successfully added into this game. Furthermore, to arise the understanding of Macau’s and Melaka’s culture, several activities including visit Macau Gallery in Melaka were organized. The program, in general, ran smoothly as the rehearsals of preparation period. The LLC student Gabriella reflected that “I want to go to the last level of the Mathematics game but its already time up…”. Gabriella cannot concentrate on her study previously but she wanted to continue the class. Another LLC student Shelden claimed that “Thank you for teaching me through this week. I had a lot of fun and a lot of sadness because you will go home tomorrow. 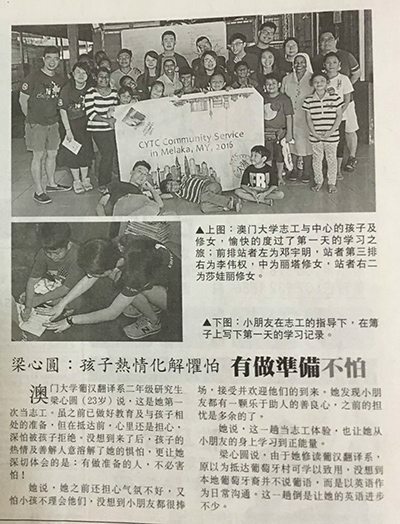 May God bless and thank you.” The students from CYTC service learning group said that this service-learning trip was really harsh but it was meaningful. This service learning trip end with happy and touching environment. After the final CYTC Monopoly Competition, all LLC students were given certificates to prove they completed this program. This program was successfully held and this implanted a seed of “happy learning” into the LLC students’ heart. Fig. 1. CYTC service-learning group taught students in LLC by the use of the CYTC Monopoly.